Italy has the greatest number of UNESCO World Heritage Sites in the world (47). Spain is second with 43. Listed below are the ones located in South Italy only. (Heritage site since 1995) - Naples, Campania. The Historical City Centre. In the 2002 film Star Wars Episode II: Attack of the Clones as Queen Jamilla's palace. The same room was also used in Mission Impossible III as Vatican City. The main staircase was also used in Angels & Demons as the Vatican's staircase. and in the opening scenes of the film Anzio from 1968 starring Robert Mitchum. Also on the Unesco list are the Vanvitelli aqueduct and the San Leucio Complex. (Heritage site since 1997) - Campania, archeological sites of Pompei. Unesco site since 1997. Ercolano (Herculaneum) lies at the western foot of Mount Vesuvius, on the Bay of Naples (Campania). The medieval town of Resina was built on the volcanic material left by the eruption of Vesuvius (AD 79) that destroyed the ancient city. Heritage site since 1979) The so-called Villa Poppaea is an ancient Roman seaside villa (villa maritima) situated between Naples and Sorrento. (Unesco site since 1997) - The Amalfi Coast (Costiera Amalfitana , Campania) in the Province of Salerno is a picturesque stretch of coastline on the southern coast of the Sorrentine Peninsula. (Heritage site since 1996) - The 13th century citadel Castel del Monte situated in Andria in the Puglia region (Apulia) . The Valley of the Temples is one of the most important archeological sites in the world and in 1997 it was named a UNESCO World heritage site. The temples are located in Agrigento, which is in the region of Sicily. The city was initially founded as a Greek colony in the 6th century BC and it quickly became a major cultural center. The doric style temples in the valley were all constructed within a century. Each of the temples face east, which was a standard criteria for both Greek and Roman temples. This was done so that the statue of the god housed in each temple would be illuminated by the rising sun. (Heritage site since 1997) - Villa Romana del Casale, a few km from the town of Piazza Armerina in the province of Enna, Sicily. Ruins of a Roman villa built between 330 and 360 AD . It is one of the largest and most lavish of such villas to have survived the ravages of time. It feature one of the richest and complex collection of Roman mosaics in the world. (Unesco site since 2002) - Piazza Armerina, Baroque town of the Val di Noto, Sicily. One of the towns reconstructed following the earthquake in 1693. These new towns were redesigned according to renaissance and baroque town planning. Major buildings like churches, cloisters and palaces were built in order to give the streets a focal point and a majestic perspective. Piazza Armerina is one of the so-called "Lombardic" communes of Sicily, as their dialect differs notably from that of the neighboring region. The other towns and cities are : Caltagirone, Militello in Val di Catania, Catania, Modica, Noto, Palazzolo Acreide, Ragusa and Scicli. 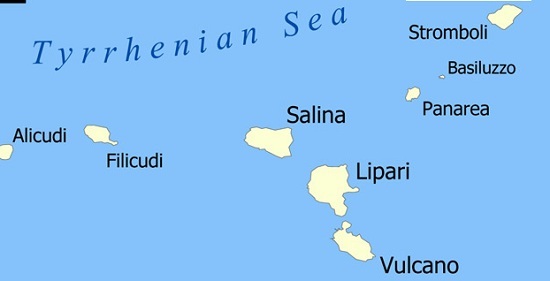 (Unesco site since 2000) - The Aeolian Islands or Lipari (eight Islands) are an archipelago of volcanic origin in the Tyrrhenian Sea north of Sicily, named after the demigod of the winds Aeolus. On the heritage site list since 1997 - Sardinia - Su Nuraxi of Barumini (I Nuraghi of Barumini), are bronze age megalithic towers that dot the island of Sardinia, still one of the worlds' undiscoverded "mysteries" . The nuragic archaeological site consist of a fortified village complex from the 16th century BC. The site lies at the foot of the Parco della Giara, near the town of Barumini. 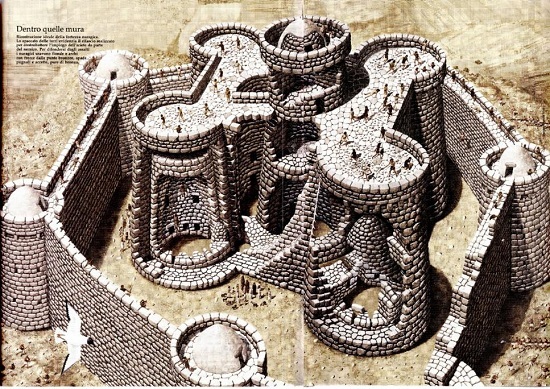 Little is known about the nuragic people or their culture and although there are many theories, the purpose and use of these towers is uncertain. Piazza Pascoli, from here the city is a postcard picture, specially at sunset. Church of the Idris Madonna, the long climb up is rewarded by a mesmerizing view of the 'disorderly' built city, with houses hanging over the brink and the cathedral on top of the mountain Civita. Belvedere Murgia Timone. Being there early in the morning or at dusk is an unforgettable, almost mystical experience, the view embraces the city as a whole..
Spaccanapoli (Naples splitter) is the popular main artery that cuts through the historic city center, narrow and crowded with life. It is the main promenade for tourists as it provides access to a number of important sights. The Royal Palace of Caserta was commissioned by king Charles VII kings of Naples. It was the largest palace and one of the largest buildings erected in Europe during the 18th century. Described as "the swan song of the spectacular art of the Baroque, from which it adopted all the features needed to create the illusions of multidirectional space". The political and social model for Vanvitelli's palace was Versailles. The king's primary object was to have a magnificent new royal court and administrative center for the Kingdom in a location protected from sea attack. The Aqueduct of Vanvitelli or Caroline Aqueduct is an aqueduct built to supply the Reggia di Caserta and the San Leucio complex, with water arising at the foot of Taburno, from the springs of the Fizzo, in the territory of Bucciano (Benevento), which it carries along a winding 38 km route (mostly underground). Its construction began in March 1753 and concluded with its opening on 7 May 1762. Of particular architectural value is the perfectly preserved 529-metre-long (1,736 ft) section in tufa bridging the Valle di Maddaloni between Monte Longano (to the east) and Monte Garzano (to the west) - this section was made a World Heritage Site in 1997 and (modelled on ancient Roman aqueducts) is made of three rows of arches, 55.8 metres (183 ft) high at its highest point. Evidence for the destruction originally came from a surviving letter by Pliny the Younger, who saw the eruption from a distance and described the death of his uncle Pliny the Elder, an admiral of the Roman fleet, who tried to rescue citizens. The ruins of Pompeii are located near the modern suburban town of Pompei, about 8 km away from Mount Vesuvius. It stands on a spur formed by a lava flow to the north of the mouth of the Sarno River (known in ancient times as the Sarnus). Today it is some distance inland, but in ancient times it would have near the coast. The excavated city offers a snapshot of Roman life in the 1st century, frozen at the moment it was buried on 24 August AD 79. The forum, the baths, the bordello, many houses, and some out-of-town villas like the Villa of the Mysteries remain well preserved. Once covered by the ashes deposited by the eruption of Vesuvius, Roman villas are today an exceptional opportunity for study. The villa di Poppea at Oplontis has been described as one of the most beautiful examples of the imperial home (as much for the sumptuous frescoes and sculptures that adorned it as its majestic position on the coastline), thus explaining its inclusion in the UNESCO World Heritage list.